Irregular patches of fungal disease in centipede grass lawn. Lawn fungal diseases take on a variety of forms – from dead-looking brown patches to highly visible spots, threads, rings, or slimes. And once they strike your yard, grass fungal diseases can be difficult to treat. Fortunately, the right lawn care practices can go a long way toward prevention and treatment; and in severe cases, a fungicide can help eradicate the spores to keep it from spreading. Here are some tips for preventing and treating fungal diseases in your lawn. Mowing your grass too low can encourage fungal disease. Brown patch of dead grass in lawn. White, yellow, or brown patches or rings that grow in diameter. Thin patches of frayed, distorted, or discolored grass blades. Gray, black, red, orange, or purple spots on blades or stems. Gray, black, or pink powdery or threadlike coatings on and around grass blades. Areas of darkened, wet-looking, slimy, or greasy-looking grass. 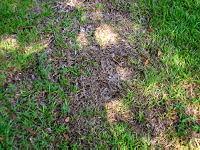 Brown patch strikes during hot, humid weather. Fusarium blight prefers hot, drought conditions. Dollar spot tends to spring up when nights are cool and dew is heavy. Before treating your lawn, it’s important to identify not only whether your lawn indeed has a fungal disease, but to identify the fungus itself. All fungicides aren’t the same, and some diseases can be easily treated by making changes in your lawn care. Knowing your grass type and recent weather conditions can make it easier to narrow down, but you may need help in figuring out exactly what’s going on. Your local cooperative extension center is your best resource for determining which diseases are most common in your area, or you can take a small baggie of the infected grass to your local garden center for help. Applying an antifungal treatment may be necessary to treat severe cases. A simple change in your lawn care practices may be enough to prevent or eradicate lawn fungal disease. At other times nature may deliver a soggy spring or summer heat wave that just can’t be helped. Stressed or unhealthy lawns are much more likely to develop disease; so the better you care for your lawn, the better the grass will be able to handle the natural conditions in your area. Soil Test: Conducting a soil test can not only identify nutrient deficiencies that lead to stressed lawns and disease but sometimes can be used to diagnose the disease itself. Check with your local cooperative extension office for more information. Improper watering can lead to lawn fungus. Grass Type: Rather than fighting nature to have an exotic lawn, choose a grass type that’s suited for your climate, soil, and light conditions. Well chosen lawns are stronger and able to fight off the normal fungal spores native to the area. Go Organic: Synthetic fertilizers, pesticides, and other lawn chemicals can upset your lawn’s ecosystem – allowing disease organisms to grow unchecked. Using organic materials helps keep your lawn in balance. Fertilizing: Both over and under fertilizing can promote some fungal diseases. Choose organic, slow-release fertilizers for your lawn, and apply them exactly as instructed. Avoid excess nitrogen, which creates a fast green lawn with very poor defenses. 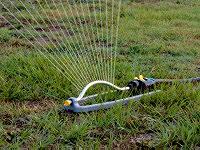 Watering: Water early in the morning, to allow the grass blades to dry during the day. Give your lawn one inch of water per week, and use a rain gauge to keep track. Water deeply, but less frequently, to encourage stronger roots and to allow the water to absorb properly. Mowing: Follow good mowing practices, including keeping the mower blades sharp and mowing your lawn to the correct height. Scalped lawns are much more vulnerable to fungal disease. If your lawn has diseased patches, be sure to wash and disinfect the underside of your mower after each use. 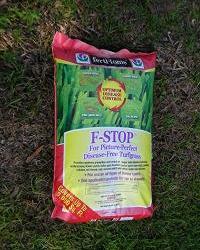 Antifungal grass treatment for lawn. Air Circulation: Many lawn fungi develop under moist, still conditions. Thin out trees and shrubs to allow air to circulate all over your lawn, and plant shade-tolerant grasses under trees. Snow: Avoid walking on or compacting snow in your yard during the winter, since heavy snow layers can breed snow molds that emerge in spring. Go Natural: If certain areas of your lawn are prone to fungal disease due to conditions you can’t change, consider naturalizing the area with groundcovers or flower beds that will be better suited to those conditions. Organic Treatment: Applying organic treatments – such as neem oil, compost tea, or a weak baking soda solution – can help with small patches of fungus. Fungicides: If all else fails, look for a fungicide (preferably organic) that’s rated specifically for your lawn disease. Fungicides won’t help your grass regrow, but they’ll get the fungal spores in check so that your improved lawn care practices can take effect. We can’t answer all the questions we receive, due to the high volume (2+ million monthly visitors), but we sure do our best! Selected questions receive a moderator’s answer, as the comments form states. Why are the questions on your page not answered on this page?It would be so helpful instead of answering the same questions over and over again. lawn overrun with fungus,bad shape,any thing how to salvage this problem? Hi there. First time lawn. Grew in nicely and has great color. A week ago I noticed a large dark patch that looks greasy. Now there are two. Thinking I might have a fungal problem. Brown patch or something. Anyway, was wondering what I can do to quickly rid my lawn of the patches. Thanks in advance! I suspect I have brown spot, brown patch, and maybe some dollar spot. How do I actually distinguish between the 3; and secondly, what is the #1 bet way to either get rid of it or at least control it for this year and stop it from returning next year. Years past my lawn was always a nice deep, dark green, this year I have this fungus. Weeds are not a concern…pretty much weed free. Cant get pic to transfer.Do u accept pics? I have to cover the entire lawn ? My son lives outside of Dallas TX him and his 2 children seem to get a lot of sinus and respiratory illness. Can his yard be some of the cause? Last yr when I was their I seemed to smell mold. He says he has treated it. I live in El Paso, TX I have Bermuda grass with big circles of grass patches. Please advice. Body them with amnple flowers and plants. I have used St Augustin this year to sod my yard. We have had a very wet summer in Mobile. I understand from all the dampness I have a fungus problem. All my grass has died and turned brown. I have used a fungicide but nothing helps. Should I spread a new layer of top soil and start over? neighborhood….very plush. I have just discovered many stems on the edge of my lawn have black on the tips of the grass. This section of the lawn is in the sun. Is this caused by a fungal disease and what can be done about it. Should I wait until spring to do anything as it is almost the end of September? Was a beautiful lawn a month ago. I have large circular spots in my zoysia, 8 to 10 feet in diameter. Eventually the center grass is restored but it seems to creep outward. What is it? Hoe do I get rid of it? How do you mix the soda an Epsom salts mixture. For. black slimy. patches on yard. I live in. Georgia but we have had an abundance of rain. What is the baking soda formula for treating fungus on saint augustine grass ? I live in Texas. Have the brown grass fungus , in summer, treated with Dr. Earth Fungicide…worked well but seems have a burgundy fungus, and a large almost square section of lawn that is yellow. I am so frustrated. However, will I ever be able to have lawn fungus free? Have had 2 bad years with brown spot fungus on long stem roses, just cut down…treated with 3 in one both years. What does one do? Just want fix. Please help. I am facing of problem in my play ground of brown round shaped patches. They are increasing day by day. The look of play ground going on worst position. The treatment of playground is on date as per prescribed by local agriculture related offices. But the problem remain same. Please suggest us the proper treatment of lawn or ground. I live in the Panhandle of Florida and sooner or later you get fungus. It rains a lot here. had fungus two years ago. I treated it and in the fall ripped out the bad parts. I have Saint Augustine and I use baking soda now. No problems anymore. Had a very large oak tree cut down that had green fungus all around the base of the tree .had the stump grounded and we filled the hole with about 50 bags of miracle grow and fertilizer. Planted grass and some of it came up had to reseed it again using the same method. Have done this 4 or 5 times and still haven’t gotten the area to fill in. What do you suppose we can do to get the grass to grow. Have not tried a fungicides yet because I don’t know what kind is best or if it will help. Thought about sod but hate to spend the money and it doesn’t work. What do you suggest?? How to prevent fungus diseases – is there any preventive chemicals available? Please someone give me some advise thank you. What is the best chemical for controlling lawn fungus? I have a fungus, it is brown spots. Scouts yard company has treated the yard twice now for it. Is it OK for me to treat it with with other scouts fungus treatment? Or should T wait for results. they treat it every month. I have some patches of fungus which are coloured green, mostly on the lawn edges. There are other areas on the lawn edges where there doesn’t appear to be any fungus and the lawn is receding more and more each year, so that only a few tufts of grass appear, but mostly there is just dirt showing. I try very hard to maintain my lawn by fertilising it, have it cored, use beetle killer on occasions and put gypsum on it a couple of times a year to break down the clay soil. I’m at a loss as to what I can do. Please can you help? What do you do to get rid of fungus in Northern Calif. And we have a lot to Dallas grass weed. It has been a drought year. We have fungal, looks like a green jelly growing. What can we do? My grass has fungus like I can pull some of my grass easily. It look like its not in the soil, its on the top of soil. How can I treat it? my lawn care guy came today for an application and I showed him on the side of my yard a completely dead grass area. He said it was dung aside. In the spring it was beautiful grass. I thought maybe my sprinklers weren’t hitting the area. Anyway before he left, he said he sprayed it. Not long after he left I went out to that area and it was bone dry! I called him and he told me the chemical dries very fast! I really don’t believe he put anything down! Please what is your thought? My grass keeper told me that I have “Cominga”or Colinga don’t know which. He says the only way to get rid of it is to dig out the affected area and resod. If what he says is true, is there a cure? It seems to be spreading very rapidly. What if I’ve been walking around in the orange fungus, turning my toes orange. How do I get rid of all of that besides just washing my feet? does ph have an impact on fungus growth? Threads of white, scaley botches have appeared on my lawn, overnite. There are about twenty of them, in a 200 sq. ft. area. My lawn is about 15,000 sq ft. How do I stop & eliminate this disease? I completely sodded my front yard with St Augustine grass last November and this spring I applied Scotts Starter fertilized and the lawn grew beautifully until early June when I noticed a burned out section of lawn about 4 sq. ft. I thought it may be caused by fertilized, but by the end of June I noticed a few new patches and the original grew to about 7 sq. ft. I applied Scotts Fungus control and the bad patches stopped spreading but the lawn is a lighter green in the areas I treated. Since you can not purchase seed for St Augustine I have to remove the bad patches and re-sod ? Or do you have other suggestions ? brown jelly like, maybe caused by over watering. New Kentucky blue grass seed laid. DOES PUTTING SAND ON MY CENTERPEDE GRASS STOP FUNGUS ON MY LAWN IN SOUTH CAROLINA? I’m in Michigan, and our snow is gone as of yesterday. I thought there was still a little left all over my front yard but I looked at it today, being it was 60 degrees and still white all over. Is it a fungus? Will this go away? I’ve never had this before and I don’t know what to do. I plan on raking the yard likely just to clean it up some, but should I be putting something on this or wait and see what happens? Thank you. There is no cure. All you can do is treat it or apply fungicide prior to the time of year when it usually begins. Once you have it (brown patch) you have it forever Some years conditions will not be favorable so the lawn will remain healthy. As for cleaning the mower, some lawn maintenance companies say to use bleach(you can never reach every crevice and if you try this, don’t forget the tires) but the best medicine is to avoid mowing the areas when the fungus is active. The outside borders will be bright yellow and if you pull on the grass blades they will come out readily. Brown patch doesn’t usually kill your lawn (at least not St. Augustine-like grass with underground runners), it is just unsightly. Once the temp gets below 60 degrees, you can rake out the dead grass. After complaining to my lawn service for the past three or four years they finally decided to test the soil for a fungus. They applied fungicide on Bermuda grass 11/10. Is this the correct time of the year for this treatment? I have a well known lawn service and they say you never get rid of brown patch or fungus you can only try and control it with their chemicals. Honestly I have it every year when the hot weather hits and the lawn looks awful. Next year I am not paying these people. I want a good answer on how to GET RID of fungus. I will do whatever it takes except move. I tried fungus control from Home Depot..didn’t work. There must be something out there that will get rid of it and not just control it. How would I wash and disinfect my lawnmower when it is electric? And what would I use to disinfect it with? What is the best prodcut for treating fungus in the yard. The grass I have 31 Fescue. I reseeded 2 years ago. My original grass was Falcon Fescue and Southern Choice. Cool season grasses. I need a good product to apply. Please advise – do I need a commercial grade or can find something at local Home Depot / Lowes? one side of my lawn is growing great. however, the other side is not growing as thick. what would you suggest??? I was wondering can a fungus also be transmitted from your Gardner blades on his lawn mower From one lawn to another Any other disease be spread this way and how would you prevent this. We had new sod beautiful after about 5 months we had a fungus he has been treating it and it only seems to be getting worse. About 60% of our lawn looks gone? How do we know when the fungus is gone and we can re-seed? Thank you. From your article it looks like I do need to bring by grass/soil up for testing. seems to provide nothing about revitalizing a lawn the year after after the fungus has occurred, eg there was fungus here last year, but how do we deal with the results this year…re seed? refertlize etc as well as the mowing tips you provide.